She’s here. She’s safe. I’ll start with that as frankly things could have been very different. It appears we have been incredibly lucky. 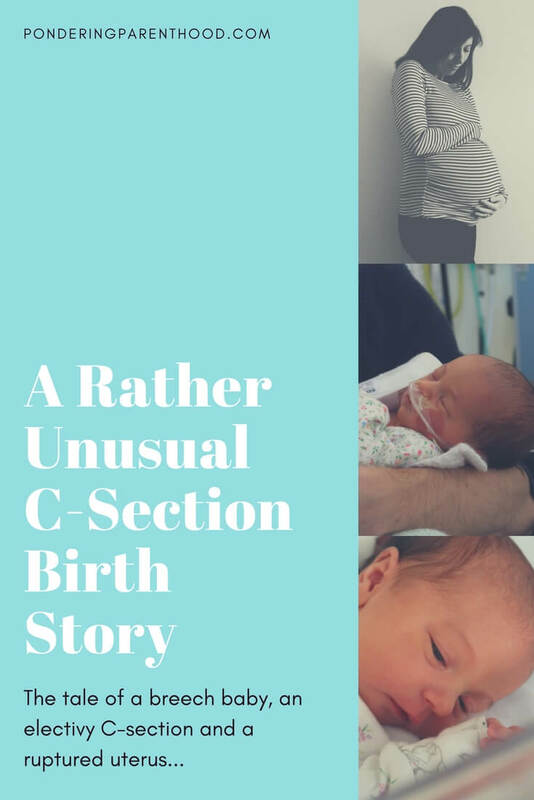 Sometime last week (or it could have been before then, I’ve lost all sense of time) I wrote about how my c-section was being brought forward because baby was measuring a bit small. This was the first lucky circumstance in a string of lucky circumstances. We just didn’t know it at the time! So, I arrived at the hospital for my c-section at 7am. I was shown to my bed, at which point I promptly burst into tears as I’d been hoping for a private room as my feeding anxieties were going through the roof. Then the nicest registrar in the world came and made me feel a million times better. I think this registrar and his consultant colleague are probably the second lucky circumstance in our string of very lucky circumstances. More on that a bit later. Next, the lovely anaesthetist who did my pre op came and said, “hi Julie, I’ll see you later, that’s your pre-operative consultation, bye!” Which I didn’t mind at all as he spoke to me at length the week before and I was totally happy with what he was going to do. I’d also overheard him telling my theatre midwife that we needed to have immediate skin to skin in theatre and she was totally on board with that. Fab. We were ready for a nice smooth elective caesarean. Anyway, we went through to the main operating theatre and the surgeons set to work. Having had a previous section, I knew what to expect, but it soon became apparent that it was taking a little longer to get to baby that it normally would. The registrar explained that there was a little more scar tissue than they would expect from just one previous c-section, and things were a little more ‘stuck down’ than usual. The anaesthetist explained that they were just being very cautious in getting to baby so they didn’t damage me in any way. Then I heard a team of neonatal doctors being called for. They had a bit of trouble getting baby out. But then she was here. At 10:35am, Baby B said hello to the world. She was checked over and weighed (6lb 3oz, so not that small) and put on my chest while I was still in the operating room. Amazing! While they were sewing me up, the doctors started asked if I’d suffered from endometriosis before. Nope. Had I experienced any abdominal pain? No. Any sharp pains at all? No… They said again how there had been more scar tissue than they’d expected. I heard them ask for my placenta to be sent to pathology. I asked why and they explained, but I can’t remember now exactly what they said. Whatever it was it certainly didn’t give me any cause for concern and I was enjoying cuddling B after what I’d thought was a lovely, calm, elective caesarean. It wasn’t until we were wheeled through to recovery (with B still on my chest) that we started to find out how eventful this c-section had been. It turns out that when they (eventually) got to my uterus, they found it had ruptured along my previous c-section scar, and they could see the baby through the hole. Yep, a hole. In my womb. One that shouldn’t have been there! I’m incredibly lucky that my waters hadn’t broken spontaneously as if they had, the baby would have been starved of oxygen and things could have ended very badly. As it was, the amniotic sac was still intact. And all that scar tissue I mentioned? Well it appears that my bowel, bladder and intestines were all stuck together and actually protecting the hole in my uterus. See? I said we were lucky. I have no idea when this rupture happened. The day before my section I took a short walk and experienced what I thought was a bit of round ligament pain, but nothing more than that. The lovely registrar reckons he’s only seen this happen two or three times in five years, so it’s incredibly rare. I think the staff have been trying to make me understand how serious the situation could have been, but to be honest I don’t want or need to think about that. We’ve been insanely lucky and B is here, so I just want to focus on that! 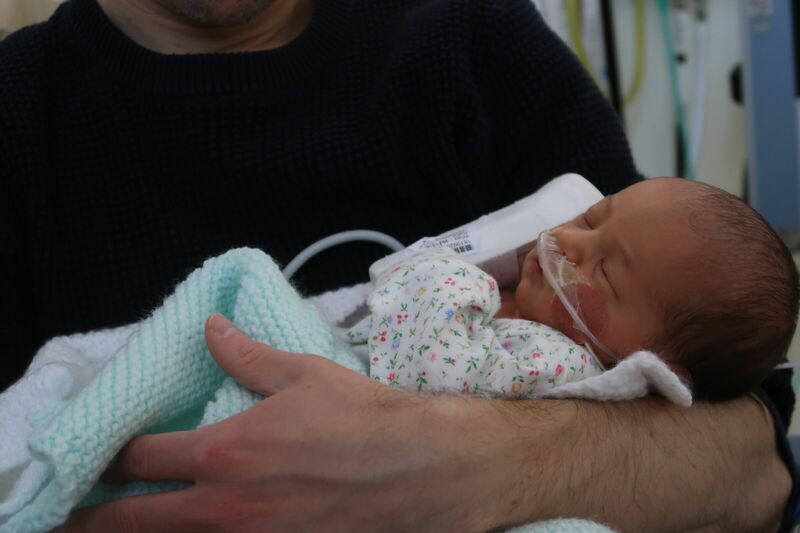 Unfortunately, despite the fact that we were able to have skin to skin straight away, almost as soon as we were moved back to the ward, B was taken to the Neonatal Intensive Care Unit (NICU) as she was having a little difficulty with her breathing, and she hasn’t yet returned to us. The NICU staff don’t seem too concerned and think she’s just got some fluid on her lungs that she needs to clear, but they’ve done a lumbar puncture just to rule out meningitis, which we’re still waiting for the results of now. B seems to be improving, though, and we were finally able to hold her again this morning, which was amazing. In the meantime, I’ve made friends with a hospital grade breast pump and I’m trying to do my bit to get her better by expressing all hours of the day and night. I’m in quite a bit of pain as I’m mostly just on paracetamol as I can’t take anti-inflammatory drugs due to my Polycystic Kidney Disease. I’ll get there though, I’m just hoping I get to have B back with me to establish feeding before they discharge me, as it will be a lot harder to get that sorted if they send me home. Whatever happens, I’m just grateful that we’re both here and relatively unscathed by the whole ordeal. It could have ended very differently. ‘Lucky’ is definitely the word of the week. Welcome to the world little lady. A dramatic entrance which as you say could have been a lot different – wishing you both a speedy recovery. Thank you. I’m just grateful to the wonderful doctors who gave me no inkling at all that there was anything amiss – they were so calm and just got the job done. They were amazing. We’re hoping to have her back with us in a couple of days. Congratulations – what a special little girl! Wow what a tough start to life your baby had! Glad you made it out of it well. Thank you. Other babies go through far worse, so we consider ourselves lucky, really! I found your story very interesting as I have stage 3-4 (bad) endometriosis and am due for csection a week today. I have notified the surgical team, but I was just wondering how your recovery has been as you mention them having to cut through significant scar tissue? Have you had a lot of pain? Thank you! I’ve been very fortunate in that I’ve had a really good recovery from this C-section – probably better than my first, in fact. But to be honest it sounds like I’m a bit unusual in that I had no indication at all that my scar tissue was so extensive. I hadn’t experienced any significant pain at all, which is why it was such a surprise when the surgeons got in there! Also, even though it was horrible having B in NICU for five days, it did mean that I was on almost complete bed rest in hospital for that time, without a toddler to run around after at home! I think this really helped my recovery as I was discharged just over 48 hours after my first C-section, and found the recovery much harder that time. My advice would be to accept as much help as you can to allow you to rest as much as possible, and don’t try to be a hero – take the painkillers that are offered! Wishing you all the best for your C-section next week.